It’s fall! The holiday season is coming right up and I am so excited! Fall is the only time of year where it is acceptable to slip pumpkin into any recipe known to mankind, so I figured that I would share something festive and delicious…. 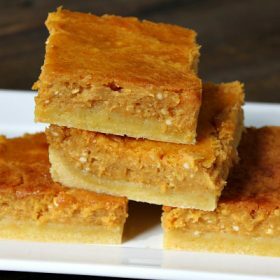 this week I made Pumpkin Gooey Butter Bars. There’s nothing like the comforting orange glow of pumpkin… it looks great and festive, and it tastes even better. Pumpkin is a miracle flavor! Delish! 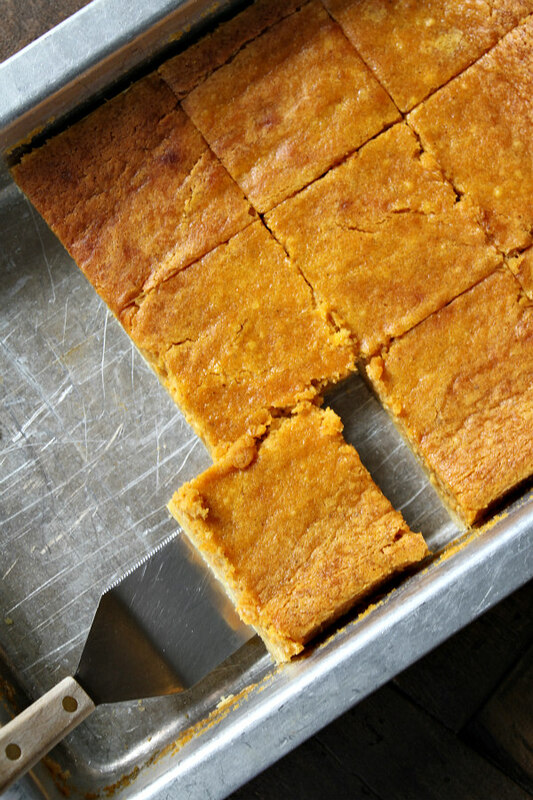 All pumpkin pie lovers out there will go crazy over this recipe. This recipe even has you looking forward to eating the crust!! It’s all about the details… If you look closely, you can spot some little specks of cinnamon and nutmeg. The bars are extraordinarily flavorful! I was more than happy with how these turned out. 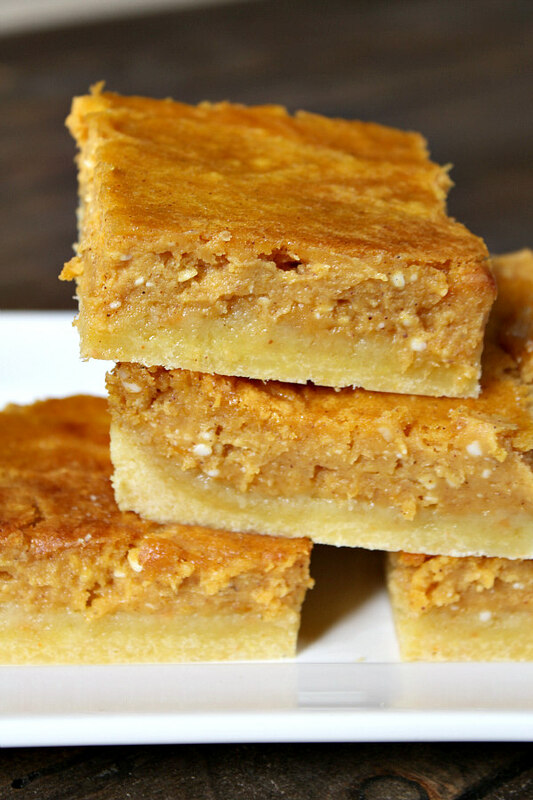 Pumpkin Gooey Butter Bars are a must-make for any party or gathering in Fall. 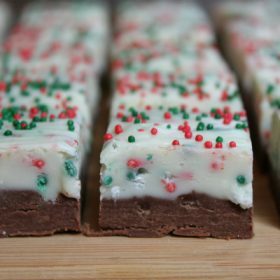 My family demolished half of the pan within an hour of making these… oops! 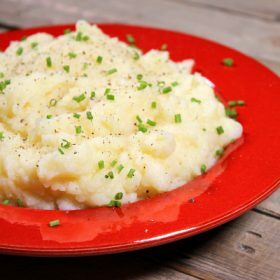 Click below to watch a short video showing you how to make this recipe, then scroll to the bottom of this post and print out the complete recipe so you can make it at home! Preheat your oven to 350 degrees F. Spray a 9x13-inch baking pan with nonstick spray. Prepare the crust: In a large bowl, use an electric mixer to combine the cake mix, egg and butter. Pat the mixture into the bottom of your prepared pan. Prepare the filling: In a large bowl, use an electric mixer to combine the cream cheese and pumpkin until smooth. Add the eggs, vanilla and butter- beat well. Mix in the powdered sugar, cinnamon and nutmeg until well-combined. Spread the filling over the cake batter and bake 40 to 50 minutes. Don't overbake- you want the center to be a little gooey! 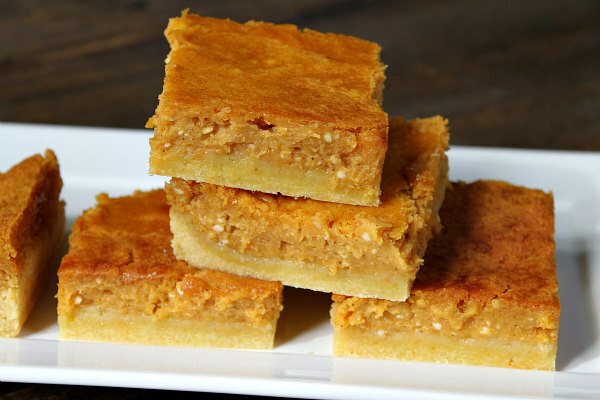 We were looking for one more Thanksgiving dessert…..this might be it!! Sounds perfectly delicious!! Brooks, this recipe is exactly what I need. Thank you!! Now, two questions: I have no baking mix. Could you possibly suggest what I shall use to make the mix myself? And I have no pumpkin puree, I will do my own, but what sort of pumpkin would be the best fit for the purpose? I hope you could possibly offer a solution to my situation? I wish you all the best this fall! Hi, I’m not sure! Maybe try to Google a recipe for how to make homemade Bisquick? Sugar pumpkins are best for making homemade pumpkin puree. Good luck! So it would be helpful if you said IN A SEPARATE bowl combine the dry ingredients. I added EVERYTHING to the same bowl since you said mix cream cheese and pumpkin then mix again without specifying. Cooking a birthday dinner for my sis in law after a day of homeschooling and grocery shopping WITH my 5 kids all while preparing for the holidays. ..i need good directions 🙂 we will see what happens! I think they keep better when refrigerated, so yes. Could I make it the day before? Does it hold up and keep good in the fridg? Has anyone tried reducing the amount of powdered sugar? A box seems like a lot and I want my grandma to be able to try these!